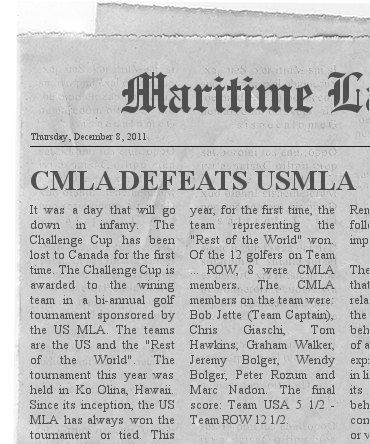 The CMLA laments the recent and suddent death of Jerry Rysanek, one of its Honorary Members. Jerry was formerly Director of International Marine Policy at Transport Canada in Ottawa. In that capacity, he was a long-time and faithful supporter of the CMLA and worked with its officers repeatedly for many years on projects like the adoption of the Marine Insurance Act and the Marine Liability Act and its annual meetings with government officials. He was also deeply involved in the International Oil Pollutions Compensation Funds, especially the 1992 Fund. The CMLA Board designated Jerry as an Honorary Member in 2011. A man of great learning and humanity, with tremendous professional competence, integrity, and a delightful sense of humour, Jerry will be greatly missed by all who knew him. The CMLA membership joins in extending heartfelt sympathy to his widow, Marta, and the family. A memorial service in Jerry's honour will be held on Saturday, February 23, 2019, at 1:00 p.m., at the Beechwood Cemetery, 280 Beechwood Avenue, Ottawa, Ontario. The Minister of Justice of Canada, on August 31, 2018, announced the appointment of Christopher J. Giaschi, partner in the firm of Giaschi & Margolis, Vancouver, and former President and Honorary Life Member of the CMLA, as a judge of the Supreme Court of British Columbia. All CMLA members join in expressing congratulations and best wishes to the Honourable Mr. Justice Giaschi, as he assumes his new and important judicial role. On September 6, 2018, two distinguished members of the CMLA will be honoured in Montreal for their lengthy and successful careers as lawyers, on the occasion of the annual Rentrée judiciaire ceremonies of the Barreau du Québec, marking the re-opening of the courts for the autumn term. The two practitioners concerned are Trevor Bishop (with 60 years of Bar membership), now retired from Brisset Bishop, and Vincent M. Prager (celebrating 50 years as a member of the Bar), who continues to practice with Dentons. Trevor Bishop started working with the Montreal firm that now includes his name in 1958, immediately following his Bar admission. During some fifty years of practice, he achieved eight victories before the Supreme Court of Canada, including the seminal decision in ITO-International Terminal Operators v. Miida Electronics, and won the respect and admiration of his many clients and all members of the admiralty Bar and Bench. Vincent M. Prager, called in 1968, after many years working for another leading law firm, now practices as a member of the Litigation and Dispute Resolution Group at the Montreal office of Dentons Canada LLP. He has been repeatedly recognized, nationally and internationally, for his expertise in the fields of maritime and aviation law, as well as insurance. 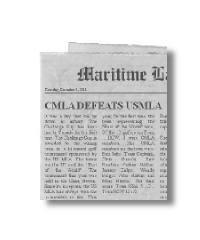 Both jurists have been faithful and active members of the CMLA for decades, and the Association is deeply grateful for their contributions down through the years. On this occasion, the CMLA wishes to extend hearty congratulations to both Trevor and Vincent on their impressive records of lawyering, as well as warmest good wishes to each of them in all their future endeavours. Canada presented its instrument of ratification of the HNS Protocol (Hazardous and Noxious Substances) 2010 at IMO headquarters in London on April 23, 2018. Norway, Turkey and Canada are the first three States to have ratified the Protocol, which will foster the eventual coming into force of the HNS Convention. Mark A.M. Gauthier was recently appointed as Deputy Administrator of the Fund for Railway Accidents Involving Designated Goods. Congratulations to Mr. Gauthier, a former Chair of the CMLA's IMO Liaison Committee, and an Honorary Member of the CMLA, on this important appointment. Anne Legars was recently re-appointed for another five-year term as Administrator of the Ship-source Oil Pollution Fund. Congratulations to this distinguished member and former director of the CMLA on her re-appointment to this important position.